Supporters of new school project rallied outside the polls Tuesday, but voters said no to the project. 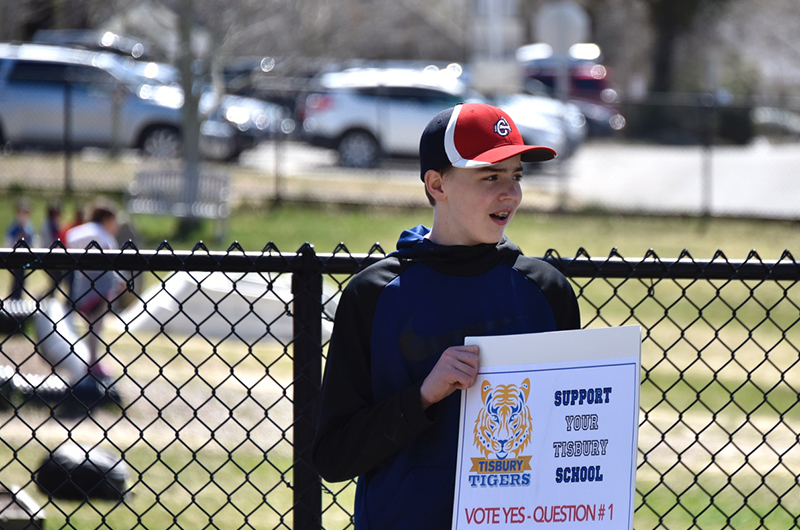 Turning out in large numbers at their annual town election Tuesday, Tisbury voters narrowly rejected the $46.6 million new school project, throwing future plans for the school into limbo. The hotly-debated school project had won approval by a wide margin at the annual town meeting in the second week of April. But in the end it failed to clear the ballot box, where voters rejected a Proposition 2 1/2 debt exemption question 567 to 546, a margin of 21 votes. The next steps remain unclear, as millions of dollars in state funding for the project hang in the balance. “I sufficiently prepared myself for either result, but I was certainly disappointed,” said school principal John Custer after the vote. “I had a feeling it was going to be a very close vote, and it was,” he added. The building committee meets Monday at 5 p.m. in the school library to discuss the outcome and next steps. Other town officials are also expected to attend. Led by its broad-based building committee, the town has been working under the wing of the Massachusetts School Building Authority for the past two years to develop the plan. It called for building a new 76,000-square-foot school on the existing site and housing students in the 1929 brick school during construction, before eventually demolishing that building. The town was eligible to receive $14.6 million in state reimbursement money for the project, leaving taxpayers responsible for $32 million. The school question has divided the town and dominated community discussion for months. 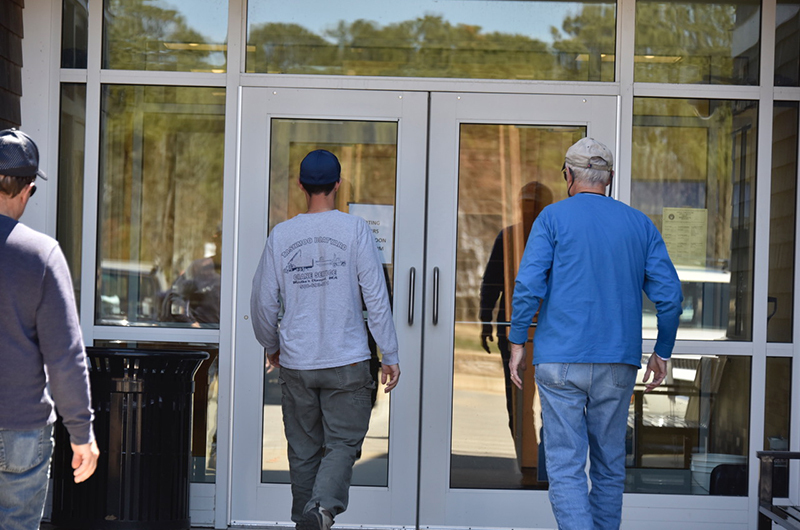 On Tuesday voters streamed to the polls at the public safety building all afternoon on a sunny spring-like day. 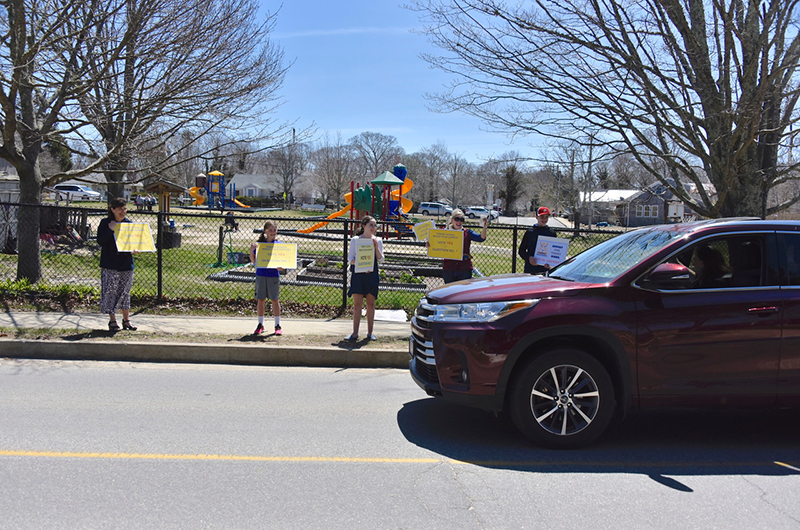 Students played outside at the Tisbury School across the street, and parents and students gathered with signs encouraging a yes vote. Casey Decker, a civil engineer in Tisbury, voted yes on the project. Other voters felt differently and were concerned about the impact on property taxes. Some vocal critics believe the old school should be renovated not demolished, an option the building committee explored at length but eventually decided against for a variety of reasons, including cost estimates that came in even higher than a new building. Some voters at the polls said they were against the project but declined to give their names. Emily Taylor voted yes on the school question. She handed her I Voted sticker to her two-year-old daughter Vianna Baird, who held the sticker on her thumb. Total turnout was 1,120, about 32 per cent of the 3,529 registered voters in town. A few minutes after the polls closed, election warden Mary Ellen Larsen read out the results. Mr. Custer said he is an educator not an engineer, but after years of planning, he believes the project as proposed was the best option. “A lot of those opposed believe there is a better project for this town. I hope there is. But in my opinion, thus far, there hasn’t been a better one than the one we‘ve been presented with,” he said. Daedelus Projects, and Turowski2 architects. Funding has been used to assess various options for school improvements, including building a new school on a different site and renovating the existing school. Mr. Custer said whatever happens, there appears to be agreement that the school is in need of serious improvements. For more than a decade, some classes have been taught in a modular unit outside the building. The small cafeteria with its limited capacity means students have extra short lunch periods. Mr. Custer said there is insufficient space for educational support services and special education. More results from the Tisbury annual town election. More photos from the polls. Tisbury....the town where town leaders want to turn down state money so kids can have the privilege of going to school in a trailer. This vote was not to question adequate school facilites for the Island youth but a challenge of a still prevailing narrow town thinking instead of pooling resources Island wide as practiced already with a regional high school and by doing so save money and get better, stronger. I'm not buying the regionalization argument at all. If any leaders in any town were interested in this you'd see them reaching out to each other all the time but they aren't. There is virtually no will whatsoever regarding regionalization. We have to look at reality in the world we live in. That's the world where the past superintendent reached out to the schools about pooling resources to buy the same toilet paper in bulk, and they said no. If we want regionalization that's great. Let's see it. Let's see those conversations. When will they all be getting together to discuss that? When will the meeting on a regional middle school happen? We just got told by multiple town leaders how expensive this is and how we need to save money. Did they reach out to anyone to possibly regionalize? Who did they reach out to? When? What did they say? Let's talk about a middle school for the island. It seems the high school is going need saving soon as well. It maybe a better use of the island taxpayer dollars. I was to ill to vote today and was quite upset because I said if those of us would Vote NO lost by one vote I would have never forgiven myself! I am going to sleep like a baby tonight and actually for the next year about this issue in our town. Thanks Tristan for sticking by your guns, the other two selectmen are useless I am glad that Jimmy Rogers is going to replace one of them. Looks the the totally bias MV Gazette shut down all comments except that one only I am assuming by their previous reporting they were for it. The Gazette is a news organization and wants comments from both sides on an issue such as this where the town is divided. Real estate taxes in Tisbury are the highest of the six island towns so this isn’t totally surprising. Also, with wages 27% below the state average and high housing and living costs, there is only so much in the household budget. I don’t know specifically how the system is set up but I know from other webwork that comments are screened for obscene language and defamatory remarks about other commentators and malicious hyperlinks. The digital media staff is not the editorial board. You put a funny image in my head of a Gazette censor waiting late at night for the next comment to be posted for some nefarious local political reason, but that is fantasy. Yippie, you have choices and could get your news from the MV Times! Bonus the Times doesn’t fact check, moreover they have been in business for about 1/10 of the time that the Gazette has. Get better soon! I hope my reply was informative. The Gazette has shut out quite a few of my comments that contained info and background on the school issue. They (and the MV Times) backed the wrong horse this time. The Gazette should NEVER have written the editorial that they did, consigning the school to the wrecking ball, and telling Tisbury voters how to spend their money. It was, simply, ignorant as well as overbearing. These override questions are on ballots across the Commonwealth. There are very large entities planning and implimenting very misleading straegies. If you don't already have one, I encourage you no voters to gather together a group to create an offensive strategy to educate the population. The tax and spenders will be back again and again.North Attleboro just passed an Override ballot question for $6,500,000 every year forever due to voter apathy. Maybe I'm getting old but never would see Students being used at Town meeting or holding posters outside voting station.Sorry sure some feel its a great way for children to learn how our Democracy works and I feel the same,just feel its not appropriate at that age,should be leaning it in the class room. Your kidding right. Question, do I get a better education because of my facilities? Answer, No. Facilities are a luxury, if I can afford them, I can enjoy them, If I can not, I make due with what I can afford. Kind of like real life. People need to be honest with themselves, the quality of an education is independent of the building you are working out of and our focus should be on the quality of the education. Just like medical costs, the cost of education in the US is non-competitive with other countries (ours is much higher, in case there's confusion) and at the same time our facilities (on average) are vastly superior. I'm a real world expert on the subject having both funded the education for 3 daughters and spent 40% of my working life in roughly 20 first world countries building professional relationships and comparing views and statistics on education. Finely, the tone of this article is that this is a set-back for the new school facility. Excuse me but no it isn't, the measure was defeated and the tax payers do not want to fund a new school, anything else is a rationalization. Please learn how to except a democratic decision and learn how to live with what we have, as that is the will of the people. This is the USA not the USSA (United Socialist States of America), at least not yet. And, you are right!! It is called "indoctrination" no matter which side you are on!! All the kids mentioned in the newspapers are consistent high honor roll kids. They are all too old to benefit directly from the new school. Perhaps they are frustrated with watching their classmates doing work in hall ways, having 13 minutes to eat, and walking through weather to a trailer. Perhaps they have this crazy feeling called "empathy." These students clearly were working for something beyond themselves and I find them inspiring. They put their faith and belief in a better tomorrow and this was a pretty poor way to repay them. In our present state of the US on the whole, immediate gratification is the norm. On an island of limited resources, economic opportunity, retiring population, and so much more, there are ways to think beyond the immediate. Plans to create a wonderful environment for students can go beyond just one building. How about some of the school proponents make matching gifts to have a small building designed and built to elevate the strains on the existing one with an eye to either yearly or bi-yearly improvements to the existing. Now there is a community building proposal that even the children would learn that good things take time along with a community of help. I too am worried about the increase in taxes if a brand new school was forwarded. The thing that has been lacking in this process has been imagination, thinking outside the box. The TSB never proposed the idea of fiscal responsibility by suggesting a two fold concept of building a smaller, separate campus building with bi-yearly renovations to an existing building. This would cost more on the long run but would not hit hard immediately. It would spread costs out over thirty plus years and as in previous decades, the possibility of building gifts from private individuals could be received. On my last comment on using students out side polling station, I don't see any students holding a NO poster,there is 2 sides to this proposal school project.Also pleased to see Jim Rogers in as selectman,hopefully being a self-employed business man he can bring back some of these large projects like Stop and Shop and much needed tax revenue we have been loosing because of the anti business attitude in our Town.Also end law suit on Santander bank roof its crazy ,must be costing us as tax payers a fortune in legal fees like it did on Boch project on Beach rd,..need some common sense on these projects. No one knows how much the T.B.O.H spent to shut down my wood boiler, lawyers from Boston are not cheap I know one is $10,000 per hour. Socialism ends when you run out of other peoples money ! I moved here almost 40 years ago and picked Tisbury as the town to live in with pride. Today, not so much. The events of the last few years have made us the laughing stock of the island towns. Killing Stop & Shop, a bad cop, Santander suit, stagnant Main Street, Boch attacks, the new school - we always seem to shoot ourselves in the foot. I'd blame our town leaders but we all voted them in. So it is us to blame. The towns around us are planning for the future. We're stuck in the past. Must not have driven down Main St. VH lately, most of the shop fronts are open, have displays and others are opening for the season. How about offering some time volunteering to help our Main St? Couple of organisations could use it. In the future we must make sure that children are not used by one faction or another of a town issue. It really was upsetting to see how children were being used to push the new school agenda. So, the children wanting a new school was them being used? They are the ones dealing with freezing cold classrooms and going back and forth between trailers. I think it is absolutely fair of the children to voice an opinion on THEIR school. The kids decided by themselves if they wanted to hold a sign. There was no requirement or persuasion by teachers or administration. These kids have been in their schools student council and are probably more informed about the topic then you are. Most of these kids are consisting high honor roll students and are truly dedicated to the topic. If the kids wanted to hold a vote no sign they could, the ones that decided to hold a sign truly wanted the yes vote. I hope that the proponents of building a new school will not be jaded by this vote and will still work to benefit the kids by coming up with a more modest renovation/addition plan. This is what the majority of the town wants. Let's see wha the TSBA can come up with. Sorry, but it doesn't work that way. Once the state approves the design, they allot the state funds for that design only. After a failed referendum, Tisbury gives the money back to MA School Building Authority and then goes to the back of the line and waits their turn until they get to the front again. This state money for Tisbury now goes to the next town that is now at the front of the line. Tisbury can apply for a renovation / addition project, but the town won't be getting to the front of the line again for a few more years. Any renovations until then are solely on the town's bill. Keep in mind. The only money the state has is taken from it's citizens. PS. There was a TYPO on my part. Looks the the totally bias "MV Times" shut down all comments except that one only I am assuming by their previous reporting they were for it. At my age I get confused at times as both island papers clearly slant to the left the MV Times pulls slightly ahead of the Gazette from time to time jocking for that first place title. I apologize for the typo. All law suits should be VOTED ON ! Some observations for everyone. The democratic process has now played out. No new school this year or maybe ever. This morning the doors opened at the Tisbury school and kids streamed in. Education will take place, perhaps a little dampened today, but the building is exactly in the same condition as yesterday. No funds have been appropriated to fix what is in need of repair for another year. I implore the 400+ people who voted "no" above and beyond those who stood at town meeting and were counted to figure out pretty quickly what number you will support. 10 Million? 15 million? 25 million? If you want to preserve the building that was constructed in 1929, you will need to put very serious money into it. For those who advocate for a middle school, Chilmark voted down the central fund for the High School. Good luck getting traction for a Middle school and getting those costs approved island wide, and you will still need to fix the Tisbury School. You pay twice. We clearly have a very divided town based upon this vote. 3 to 1 at town meeting vote "yes", and nearly 1 to 1 at the ballots vote "no". 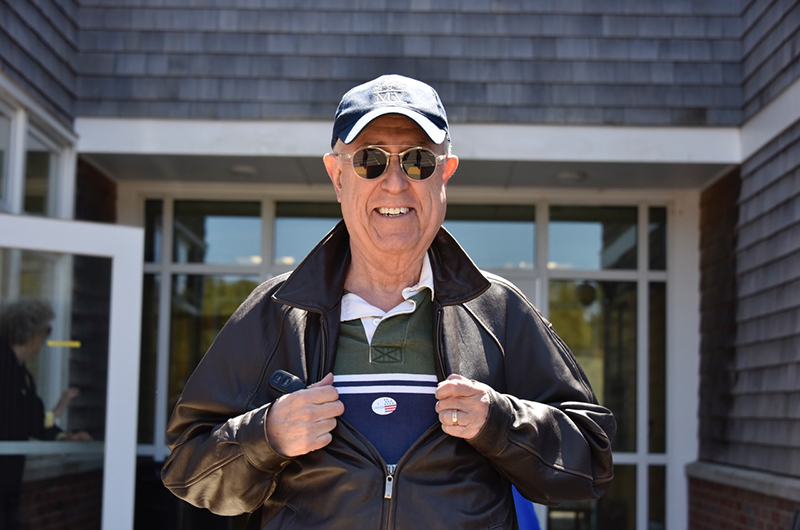 I read lots of criticism in the papers about single issue voting at town meeting. The ballot box demonstrates this is true in both directions. Perhaps next year we will have another prop 2 1/2 on the ballot again for needed school repairs as well as new town hall since we voted to buy that land on night 3 of town meeting. Let's hope the frustrated 1/2 of voters have short memories or we will get nothing done that requires significant expense to fix our crumbling infrastructure. You of course know that the school has been neglected for years. Whose fault is that? The school administration should be ashamed of themselves. How would you like to be in a school in that condition? Let’s work together to repair, replace, and renew our beautiful, sturdy Tisbury School. Make it a source of pride again. Maintenance just isn't done on the Vineyard. Not on new buildings or old buildings, on athletic fields, etc. Maintenance was never included in any of the estimates of a new building. I think the taxpayers of Tisbury dodged a huge bullet. I also believe that building can be completely refurbed for far less than those "rough" estimates they used...probably under $10 million. However, it's all a waste of money when maintenance isn't budgeted, managed and performed. The administration at the Tisbury school are dedicated, hard working educators. If the town doesn't give them money, how exactly are they supposed to do anything? Perhaps a civics lesson for everyone about what prop 2 and 1/2 is. If you want to spend over a 2.5 growth of taxes, you need this override so the town managers don't go hog wild. It protects you from spending without your knowledge. It works, but think about about it. Energy costs to run the town don't go down, they go up. Salaries go up, benefits costs go up. One extra snowstorm and costs go up. Please think about how the budget is built year after year and stays below this threshold. We don't do ongoing infrastructure maintenance because you choose between having the heat on and keeping your teachers, plow drivers, police vs. marching in front of the town meeting year after year asking for overrides. Show me a business that keeps cost flat year after year at 2.5% growth in expense. Stop passing the buck to everyone else about what they did or did not do. We all have them between a rock and a hard place because it is expensive. Bring on prop 2 and a half regularly and enjoy the fireworks at town meeting.
" If the town doesn't give them money, how exactly are they supposed to do anything? " Er, they manage their budget. If the School committee and maintenance do not budget for the needed maintenance and CAPITAL IMPROVEMENTS---surprise!! the money will not be appropriated by the Town. And this is exactly what has occurred. The School Committee has decided to spend all of its money on staff, etc., not on upkeep and updating of the building. And, they provide the Town with a very vague budget that makes it difficult to see what they are doing. They just get an increase every year. This has to stop and the School Committee must get more proactive oversight from selectmen and the FinCom. The days of just automatically getting all the $$$ they want, and used for who knows what, are probably coming to an end. We built our school for almost half of what Tisbury is asking for theirs. They should go back to the drawing board. I went to a school and a highschool that were both built in the 1700s. Rennovation can work and is definitely worth investing in. This project was simply much too costly for the residents of the town. Perhaps it's time for all towns to examine their spending. Huge infrastructure and expensive requests need to be critically examined, especially given the aging demographics and the fact that many seniors can't afford property tax increases.For some it might not be an issue but for others an increase of even a few hundred dollars has consequences. That being said, given the town's current tax rate, it seems that they can't even keep tenants on Main Street, so something is definitely amiss. According to the Edgartown School web site their building was built in 2001. The cost of a lot of things have gone up quite a bit since 2001. Take a look at what happened to the cost of college since 2001 or the property value of homes or the stock market. The stock market is more than triple what it was in 2002. This is why it's a good idea not to delay. Building cots go up. One voter praises the obstructionist Selectman Israel and the next one lists a litany of projects killed by Tristan. It goes to show the divided and polarization of this town. Tristan has blocked way to many good things for Tisbury and does not represent a majority of voters on 99 percent of the topics. Most of what "Tisbury 38 years " talks about are all things, bad things, that has happened under the reign and dictatorship of Tristan Israel. When is he up next? I agree. The negative things listed earlier here may not be view by Tristan Israel as "bad things" but his hands have been the one stirring the pot on all of them. Change would be good and I plan to run against him and his platform of stopping progress on many consequential items coming before our town. I can't think of what legacy he has left for our town. And your name is...? I can’t think of a more honest, hard working elected official in Tisbury than Tristan Israel. I don’t always agree with him but I don’t blame him for the fact that your favorite projects have fallen through. You sound a little whiny to me. There are lots of people who will vote for Tristan. Good luck. Passing the buck, indeed. The Tisbury School Committee has not come before the town to ask for any money for renovations. It seems the building was given up on a long time ago. Indeed, as one speaker said at town meeting, at least as far back as 2013 the school committee voted to build a new school! Tisbury pays the highest property tax rate on MV Island. Please stop calling the town Tisbury. It is called TAXbury! One of the lowest tax rates in the state. We used to use that to our advantage. Now we give back the state money and kick the can down the road with no real plan and pat ourselves on the back. So proud of you Tisbury!! Stick to your guns on this one!! The island of MV needs to think about regionalization of all education and public safety. You have 6 of everything on the island except the High School. With technology today we don’t need all the duplication. As this vote shows, people do not want to pay higher taxes for the next 20 years. Regionalization or islandization what ever you want to call it. Time to get into the 22nd century. No. A thousand times, No. We are 6 (7) unique towns with unique needs. The building of MVRHS was the beginning of the end, the beginning of the dismantling of our communities. We have become one big mish-mosh. Besides, many educators believe that the worst thing you can do is pile one age group, especially this particular age group, into one location. Furthermore, you can't lessen the traffic problems while at the same time putting everyone into cars and buses and transporting them to a central location on the island. Same is true regarding that airport grocery store you're always hollering about. Big government is not better government. My mother saw that happening with the welfare department and is the reason she got out. When welfare was managed locally, people were cared for much more efficiently. No more dismantling of our towns! Math didn’t work. 300 students. 40mill. Over 20 years, that’s 60k per student per year. That isn’t including operating costs for the school - which the administration was quite proud of as being much higher than the rest of the state. School building cost (capital expense) 60k per year per student. Operating cost (teachers and staff) at 26k per? For 86k per year, we need a better deal. Also: everyone is aware tisbury has the highest tax rate as well as the highest tax bills. Let’s fix our revenue picture: get beach road and the waterfront contributing tax dollars, stop being nimby in the stop and shop and running biz out of town. If we can come up with a reasonable compromise to increase revenues and decrease the capital expense for the school I’m sure we can come up with a palatable middle ground. There are way more than 300 students that use the building over a 20 year time period. Add to the fact the new building was also set to have a pre K with I have no idea how many kids and there would have been even more. Also add in the fact that the life of the new school was going to be much longer than 20 years. Also keep in mind that today's dollars are more valuable than dollars in the future, and what would have happened would be that the state would have given us $14.6 million dollars in 2018 money but you get to pay this off over a period of time where the money gets less valuable over time. We have very low borrowing costs right now. This project was supported by the FinCom for a reason. The vote from them was 6-0-1. Tisbury has lost one of its oldest residents - the Linden Tree is dead. One of the most alluring names of Martha’s Vineyard is that of Lake Tashmoo.